The Bitcoin network protocol operates to provide solutions to the problems associated with creating a decentralized currency and a peer-to-peer payment network. Key among them is the use of a blockchain to achieve consensus and to solve the double-spending problem. A bitcoin is defined by a chain of digitally-signed transactions that began with its creation as a block reward through bitcoin mining. Each owner transfers bitcoins to the next by digitally signing them over to the next owner in a Bitcoin transaction. A payee can then verify each previous transaction to verify the chain of ownership. 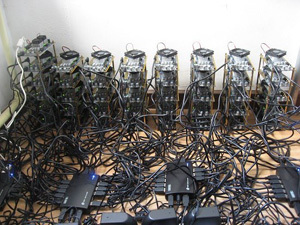 A very common way to get free bitcoin is the mining extraction, than articipate in a mining pool. To provide a more smooth incentive to lower-performance miners, several pooled miners, using different approaches, have been created. With a mining pool, a lot of different people contribute to generating a block, and the reward is then split among them according to their processing contribution. This way, instead of waiting for years to generate 25btc in a block, a smaller miner may get a fraction of a Bitcoin on a more regular basis. In recent times miner pools have increased exponentially by offering you a wide range types of remuneration, here you can find a comparison chart to assist you in choosing. POT - Pay On Target. A high variance PPS variant that pays on the difficulty of work retuened to pool rather than the difficulty of work served by pool. PPLNSG - Pay Per Last N Groups (or shifts). Similar to PPLNS, but shares are grouped into 'shifts' which are paid as a whole. PPS - Pay Per Share. Each submitted share is worth certain amount of BC. Since finding a block requires shares on average, a PPS method with 0% fee would be 25 BTC divided by . It is risky for pool operators, hence the fee is highest. Score - Score based system: a proportional reward, but weighed by time submitted. Each submitted share is worth more in the function of time t since start of current round. For each share score is updated by: score += exp(t/C). This makes later shares worth much more than earlier shares, thus the miner's score quickly diminishes when they stop mining on the pool. Rewards are calculated proportionally to scores (and not to shares).